Note: For V8 models with 2-1/2'' wide rear springs. 2000-01 models equipped with factory ''Off-Road Package'' will have 1'' less lift. Skyjacker builds such quality suspension components that many believe they're the standard of the 4x4 industry. 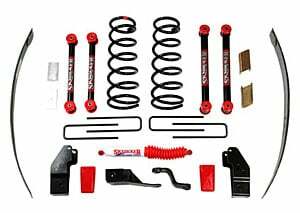 Skyjacker Suspension Lift Kits undergo countless hours of research, development, and field testing to ensure they work to the ultimate performance level without clearance issues or other weak links. For the most part, Skyjacker Lift Kits are designed to bolt on without major chassis modification. Cutting factory brackets and minor welding will probably be necessary to accommodate some of the higher lift kits. Lift Kit contents vary from front and rear springs only to new spindle mounts/steering knuckles, drop bracketry, heavy-duty crossmembers, and longer control arms. Does Skyjacker D5012K fit your vehicle?